A couple of weeks back I flew to Sydney to take part in a ride hosted by Ducati Australia called the ‘Sydney Scramble’. The ride brought a few good people from the online motorcycle community together for 2 days of fun on the current 803cc Scrambler range. We weaved our way a few hours north of Sydney into the NSW hills and even tackled a 60km stretch of dusty unsealed road to see how well the standard Scrambler and the long-legged Desert Sled handled it. 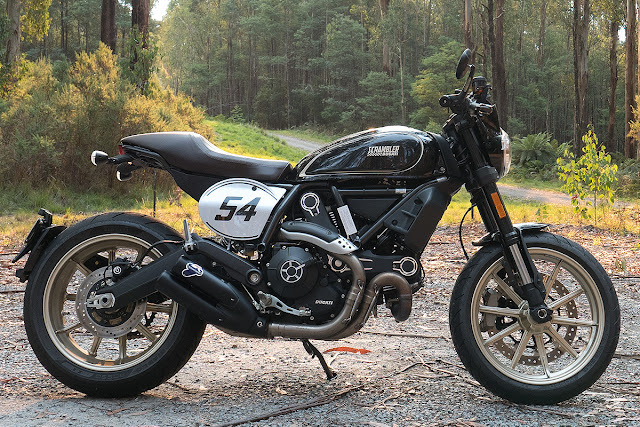 Unfortunately, because of the off-road leg of the Sydney Scramble, the one bike I really wanted to test out didn’t make the cut, the Scrambler Café Racer. Thankfully Ducati picked up on this and when I returned home they arrange one for me to test ride. When is a Scrambler not a Scrambler? First things first I’d better address the Elephant in the room, the bike’s name. 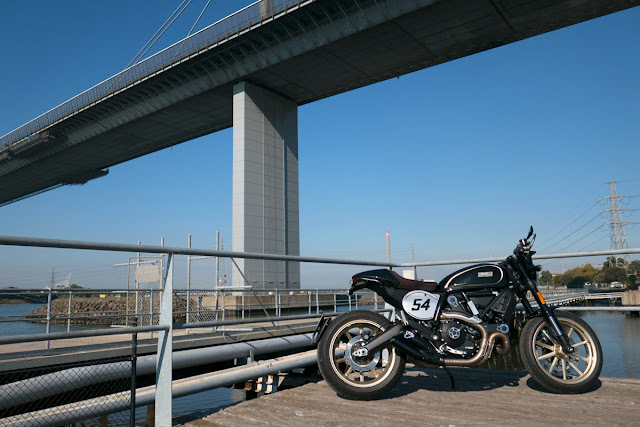 The Ducati Scrambler Café Racer. A double entendre, if ever there was one. 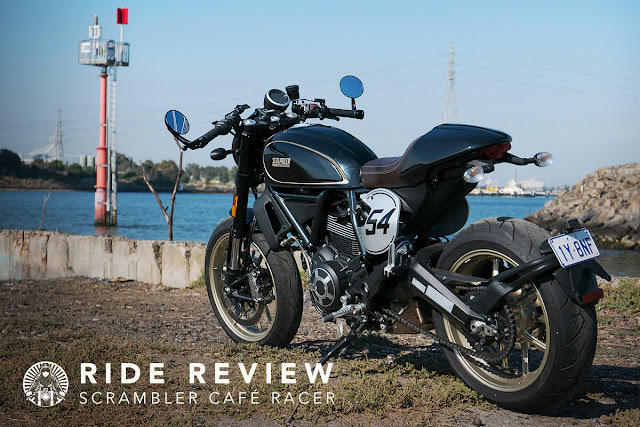 For those immersed in the custom world, this is particularly confusing as you recognise the term scrambler as a style of motorcycle, just like we do the term café racer. However, when Ducati created the Scrambler they used the word as a brand name, not just the style. They then created variations of the bike giving them all names that were preceded by the Scrambler label. Sure that meant things got a little confusing with the introduction of this bike, but when someone mentions the word Scrambler to you what’s the first bike that comes to mind? Gold star marketing right there. 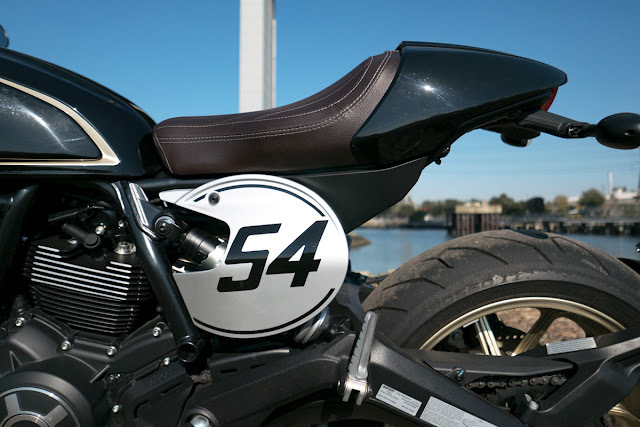 So, despite the Scrambler Café Racers confusing naming scheme, it all makes sense... kind of. Most of the previous models in the 803cc Scrambler line up (aside from the Desert Sled) have been revised versions of the standard Scrambler. They were simply different paint schemes, exhausts, wheels and handlebar configurations on the exact same running gear. Due to that trend, I had assumed that the Café Racer would follow suit. Thankfully I was wrong. Aside from the obvious styling changes the Scrambler Café Racer has a few tricks up its sleeve that makes riding it a very different kind of Scrambler experience. Style-wise Ducati has mixed in the basic ingredients to create an off the shelf café racer. There are clip-on handlebars that are positioned high for comfortable riding and 1960s style bar end mirrors. The wasps tail rear end also looks the part and can be converted into a two-seater by simply unscrewing the rear cowl. The bike also happens to look great in its classic Ducati black and gold paint scheme. In fact, I’d say it is my favourite colour combination in the entire Scrambler range. The subtle gold accents and gold cast wheels aren’t at all gaudy and the black paint has a light metal flake that gives it a swanky shimmer in direct sunlight. Everyone's entitled to an opinion and there are a few things I'm not completely fond of on the Café Racer. I find the side number panels a little confusing and more of an attempt at being cool than actually having any relevance. I’d also love to have seen the bike rolling on the same spoked rims used on the Scrambler Classic and perhaps a different shaped set of mirrors since round ones always look cheap to me. Also while the license plate and fender over the rear wheel keep the tail tidy I’d opt to move the plate back up to the tail and ditch all that additional weight. Those twin Termi pipes look and sound great, but they could also do with being replaced by something more akin to an old-school megaphone. 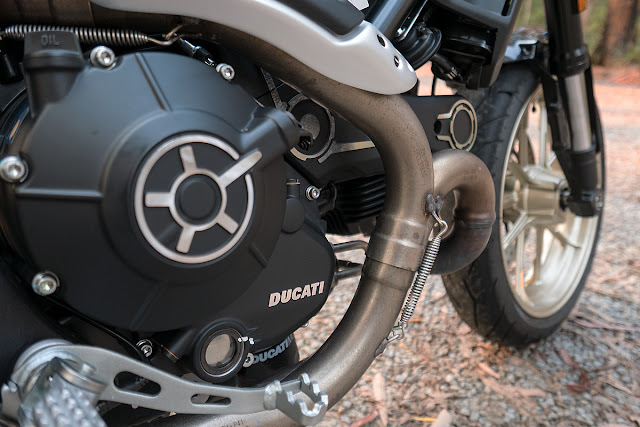 Thankfully all of that can be very easily done by either utilising parts from Ducati’s own catalogue or hitting up aftermarket experts Rizoma who sell a complete range of Scrambler bits and pieces. So the Scrambler Café Racer looks the part but what makes this bike any different to the other Scramblers and why the premium price tag? A quick glance at the Scrambler range spec sheet and things don’t look all that different. The Café Racers 803cc engine produces the same 75bhp and 50 pounds of torque as the rest of the range. There are 6 gears, ABS, the same digital gauge (although it’s set off to one side) and the same 41mm Kayaba USD forks. But when you drill down further a couple of things stand out. Firstly the mono-shock supporting the rear end is a higher spec, progressively sprung item that offers pre-load adjustment. The front end anchors are also more capable Monobloc Brembo items and the 18-inch front wheel has been switched with a 17 to match the rear. The rubber used is also more performance focused Pirelli Diablo Rossi II hinting that Ducati hopes you will ride this machine with more gusto. And lastly, the overa ll length of the bike is shorter due to the Café Racers rake being reduced. 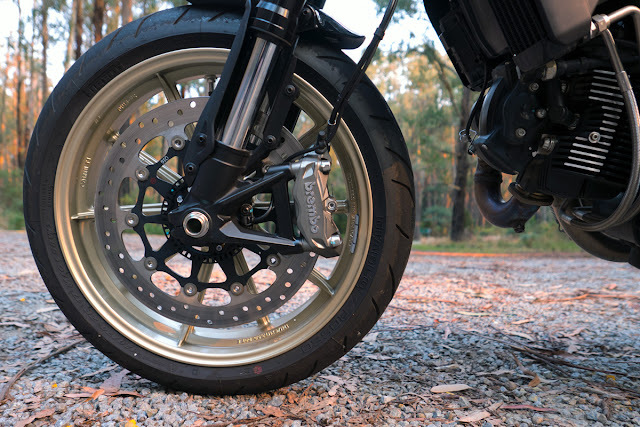 What I discovered during my week of riding the Scrambler Café Racer was that those few changes produced a dramatically different riding experience that was all for the better. Due to the reduced rake, the bikes front wheel turns in without hesitation making steering via the clip-ons very direct. At first, it felt almost too eager to turn but I soon grew used to it and found myself tackling corners with minimal use of the brake. The Café Racers progressive rear shock is a vast improvement over the standard Scrambler. During the Sydney event there were a few times when I thought I’d found the limit of the rear end, but on the Café Racer that never happened. Even big bumps on the tarmac turned into smooth bounces; something my lower back is very grateful for. Although it wasn't instantly obvious the Brembo also did its job well. 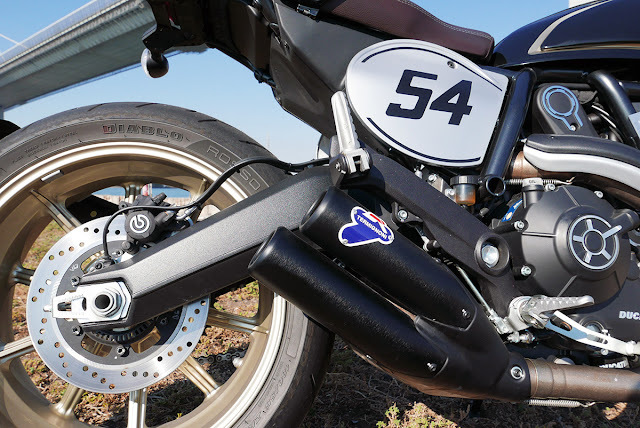 Because of the revised riding position, the front end of the Café Racer has to deal with more weight and while the forks felt overworked at times the brakes never did. As with the other Scramblers, power is delivered smoothly. So smooth that you may be fooled into thinking that this bike isn't all that quick. Rolling your wrist further around and stretching out the gears will quickly prove otherwise. The Scrambler Café Racer sits at the upper end of the current 803cc Scrambler price range outdone only by the top spec Desert Sled. Interestingly in Australia, this price is only $800 less than the upcoming 1100cc Scrambler (standard model) that’s due out next month. If Ducati’s trend for releasing variations on the Scrambler platform continues we can expect to see a Café Racer in the 1100 ranks at some stage but don’t expect that one to come cheap either. So, you ask. Would I spend the extra cash to own this bike over the standard Scrambler? Emphatically, Yes.